The summer of 2013 has mirrored the summer of 2012 or 2011 in many ways, especially as it relates to the assault on women’s bodies. Enacting countless pieces of legislation and working overtime to silence critical voices, the GOP and their faux news allies have continued their march backwards toward a retrenchment of patriarchy and misogyny. So I think that there’s a kind of moral panic, a fear of the end of whiteness that we’ve been seeing a long time and I think Obama’s ascension as president kind of symbolizes to a certain degree and I think that this is why one response to that sense that there is a decreasing white majority in the country and that women’s bodies and white women’s bodies, in particular, are obviously a crucial way of reproducing whiteness, white supremacy, white privilege. She points to the sad truth of history. From Eugenics to forced sterilization, from America’s immigration policies to slavery, the connections between reproduction, systemic efforts to control women’s bodies, and race are clear. American as apple pie. In the aftermath of the 2008 election of Barack Obama, in light of Census reports about demographic shifts that point to end of white majority, and media accounts on how “Most Babies Born in America Are Not White” there is a growing unease or anxiety from segments of white America. Context matters – that was Dr. Tillet’s message. If you oppose late term abortion and you’re white, you might be supporting white supremacy. An amazing display of bigotry and insensitivity to the abortion issue. An incredible display of racial hatred on national television. Clearly, the “F” in Fox stands for failure, because O’Reilly, Megyn Kelley and others continuously demonstrated poor reading or listening comprehension skills. I can only imagine the historiography in O’Reilly’s books. Notwithstanding the systematic mischaracterization of Dr. Tillet’s analysis, O’Reilly fails to account for the anxiety and fear resulting from “not enough white babies.” Instead he denies this reality, and not surprisingly FACTS. Because for Fox, the “F” is silent when talking about facts, leaving us with a channel that merely acts or pretends to be a source of news. This is why rather than engaging Dr. Tillet’s analysis, O’Reilly chose a path defined by bullying, disengagement, distortions, and an overall dismissal of the real issue at hand: white anxiety and its impact on the abortion debate. Do your duty. Make more babies. That’s a lesson drawn out of two interesting stories over the last couple of days. First, a story yesterday that half of the kids in this country under five years old are minorities. By far, the greatest number are Hispanic. You know what that means? Twenty-five years and the majority of the population is Hispanic. Why is that? 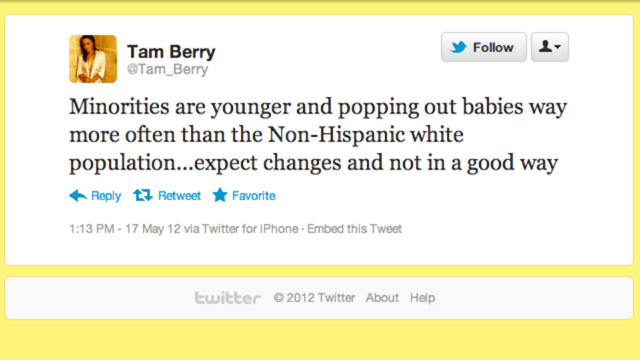 Well, Hispanics are having more kids than others. Notably, the ones Hispanics call “gabachos” — white people — are having fewer. Now, in this country, European ancestry people, white people, are having kids at the rate that does sustain the population. It grows a bit. That compares to Europe where the birth rate is in the negative zone. They are not having enough babies to sustain their population. Consequently, they are inviting in more and more immigrants every year to take care of things and those immigrants are having way more babies than the native population, hence Eurabia. Why aren’t they having babies? Because babies get in the way of a prosperous and comfortable modern life. Peanut butter fingerprints on the leather seats in the BMW. The Euros are particular — in particular can’t be bothered with kids. Underscore that second point…. In demographic terms, more white Americans died in 2012 than were born. Never before — not during the Civil War bloodletting, not during the influenza epidemic after World War I, not during the Great Depression and birth dearth of the 1930s — has this happened? In ethnic terms, it means that Americans whose forebears came from Great Britain, Ireland and Germany, Southern and Eastern Europe — the European tribes of North America — have begun to die. Readers of Fox Nation, that reliable bastion of whackadoodlery, rated the story of the nonwhite birth rate surpassing the white birth rate as “Scary.” And commenters are frightened, but resigned. One said, “It was bound to happen.. with anchor babies and pay raises for more chillrin…” Others, who clearly still don’t understand the concept of “structural racism” having nothing to do with sheer numbers and everything to do with power, wondered if they’d get special consideration for entering “government school” now. You know, like all those Mexican children of undocumented farm workers who are applying for admission to Harvard, unseating deserving white applicants. Another said, “Not hard to believe. Los Angeles in the 1970’s was overwhelmingly white. Now it’s overwhelmingly latino. The latinos took over. Just look at the school demographics. That pretty much tells the story. This country is slowly being returned to Mexico with the help of politicians.” Hard to argue with that! While O’Reilly and Leslie Marshall (the “liberal” who discussed Dr. Tillet’s appearance) want to locate these viewpoints as those of “extremists and skinheads,” they are central to American history; they are evident within a myriad of contemporary spaces, from FOX to the GOP. The truth hurts (there clearly is no “T” in Fox). But why bother with truth when you can just be a bully. Yes, I said it. Bill O’Reilly is a bully. Why else would he put Dr. Tillet’s picture on the screen several times but to arouse his audience? To spark vitriol; to intimidate. Does it surprise anyone that she received hundreds of hateful messages? With a huge platform, Billy and his faux news minions are a threat to democracy and substantive conversations. That is neither a controversial statement nor anything new, but a threat nonetheless. Fox being Fox cannot be a defense. The combination of miss characterizations – LIES – and their play to emotionality, white resentment (their race card), and ignorance are all essential to the playbook of a bully – a dangerous bully. One can only hope that by 2014, we see an end to the GOP’s assault on women, and faux news assault on reason, facts, and honest debate. Sadly, I am not holding my breath for either.